“The Queen is in good company” now that Viola Desmond appears on the ten-dollar bill. 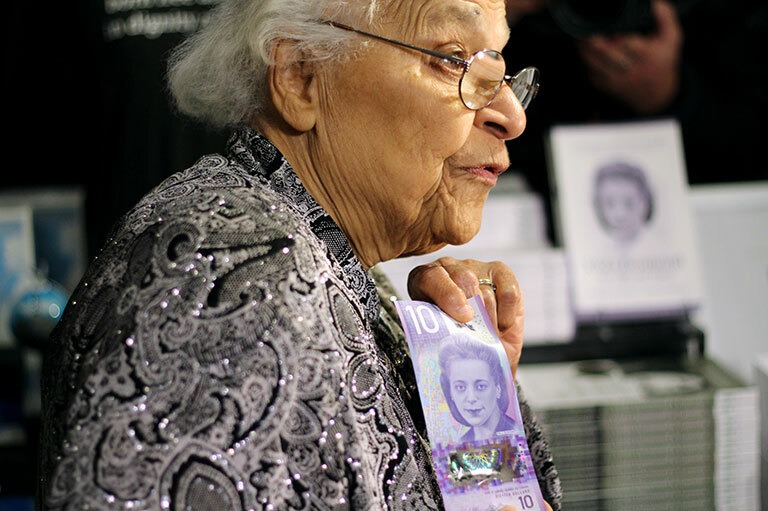 Wanda Robson makes the first purchase using the new ten-dollar bill that features her sister, Viola Desmond. The first regularly circulating Canadian banknote to feature a non-royal woman by herself was launched in Winnipeg on November 19. Civil rights activist Viola Desmond appears on one side of the vertically orientated ten-dollar bill, and the Canadian Museum for Human Rights is on the other. “It’s unbelievable to think that … my sister — a woman, a black woman — is on the ten-dollar bill,” said Wanda Robson, Desmond’s younger sister. 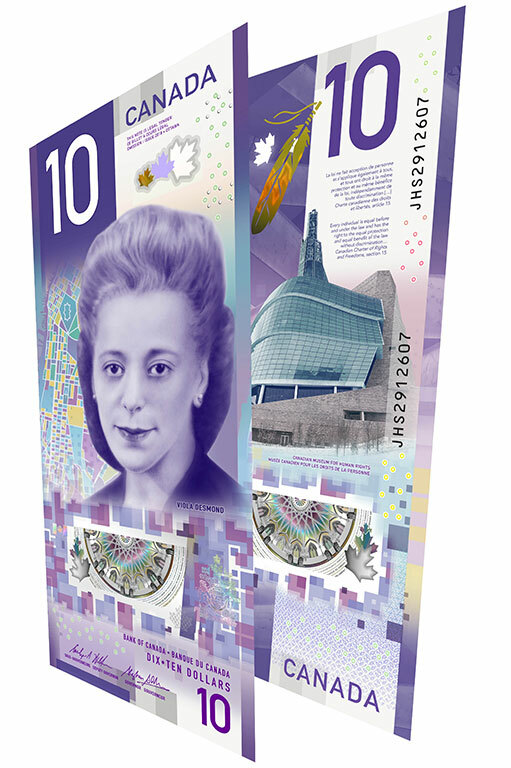 The new ten-dollar bill features Viola Desmond on one side and the Canadian Museum for Human Rights. Desmond, a black businesswoman, ran a beauty salon and beauty school in Halifax. In 1946, thirty-two-year-old Desmond went to a movie in New Glasgow, Nova Scotia, and sat on the main floor, a whites-only section of the theatre. When asked to change seats, she refused and was arrested, spending the night in jail. She was convicted for not having paid the extra cent for the cost of the main-floor seat and fined twenty-six dollars. The Nova Scotia government apologized and granted Desmond a posthumous free pardon in 2010, forty-five years after her death. In 2016, Canadians nominated more than twenty-five thousand women who they thought deserved to be featured on the new bill, and Desmond was selected. Robson made the first purchase with the bill that features her sister, buying her granddaughter a gift. At a kiosk at the Canadian Museum for Human Rights, she bought Viola Desmond: Her Life and Times, a book Robson co-wrote. Throughout the launch event, Robson smiled as she looked at the bill, bringing it to her mouth to kiss her sister’s image. At one point, ninety-one year old Robson, who uses a walker, swayed her hips and marched to a beat doing a little dance, showing her excitement and pride for the new bill. 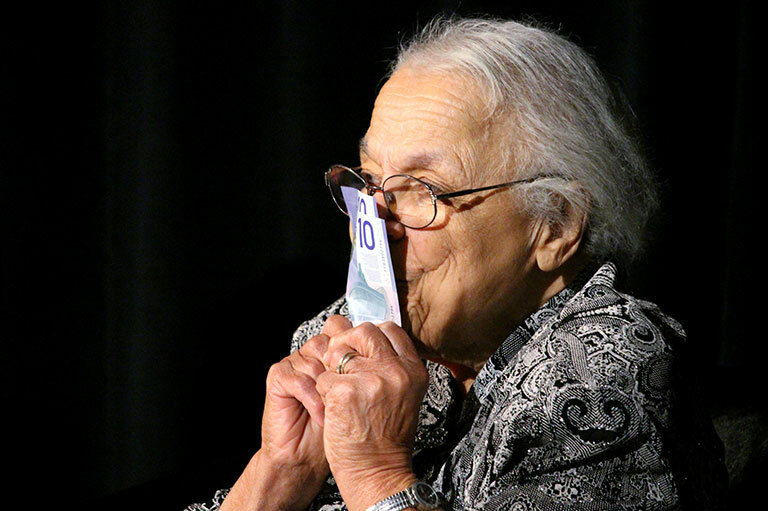 Wanda Robson kisses the bill that features her late sister, Viola Desmond. Robson also gave insight into what she thinks her sister would say about being featured on a Canadian banknote. Book Review: Photographs, letters, posters, and newspaper clippings are used to portray many past injustices and help Reynolds reveal a scar upon Canada’s past that has not completely healed. James “Gunsmith” Jones’ gift was fit for royalty. His patrimony was not.